Want to get a win like this $207M Florida Mega Millions couple? And why is their Trust name different to their own names? 1) Avoid games with a large number of balls and numbers. For example, the Malta Lotto has 90 numbers for example, so if you happen to live there - try something easier! The odds are really too high. The lower the balls and numbers, the better your odds. See the Star Rating system in LottoPredict. 2) The best way is to play 5 or 6 ball games that contain low numbers - and the lower the better. The Silver Lotto System will work with games that have as little as 35 numbers, but not as high as 90. Around 70 is the highest number - like Powerball and Mega Millions - but try and avoid those unless you have PRO. 3) Don't worry if your country doesn't feature much in the winning testimonies. Wondered why I have so many more testimonies from one particular country than another? That's because the most popular buyers of my System are from Canada, United States, UK and Australia. But players DO win regularly in many other countries as well - even Norway! 4) Use real money to play the System. You'll regret it if you win only on paper with a test. Every few weeks I have someone write me to say they forgot to play, or were prevented from playing - only to miss a huge prize. 5) Lump & Play! Set yourself goals with your time and playing money, then lump it all together in one game. You'll get better results playing all your tickets in one game than trying to stretch your funds out thinly over a dozen games. 6) Don't worry about losses. We Silverites (buyers of my System) don't like the Lose word. But believe me, you'll never regret it when your $20 ticket cost becomes $20 million. 7) Play less with more. If you are stretched on funds, play less often and use more tickets. Most players wrongly do this the other way round. And the question about Raymond Moyer and Robyn Collier of Merritt Island naming their $207 million Mega Millions trust? Turns out it was named after their dogs. The winnings were awarded in one lump-sum payment of $115,448,968. 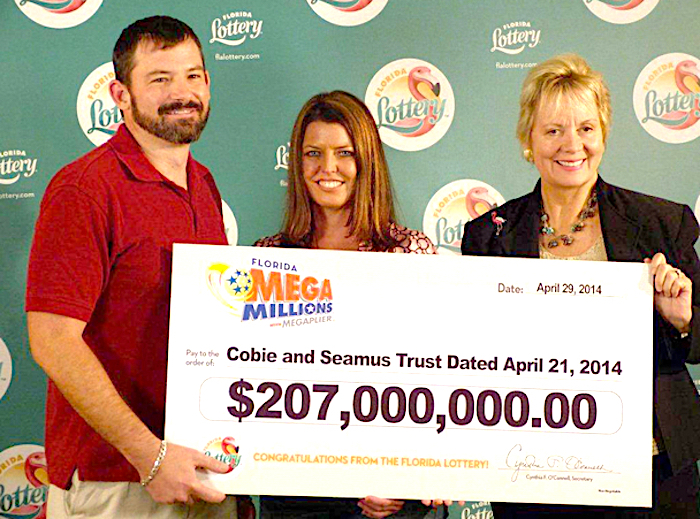 The money was deposited in the Cobie and Seamus Trust, named after Moyer and Collier's dogs, according to Florida Lottery Spokeswoman Shelly Gerteisen.